No news on the trail might be good news for Yukon Quest Race Marshal Doug Harris. Teams have been charging into Dawson City, starting with Brent Sass, who arrived first with his team at 11:24am PST yesterday (Tuesday). Dawson is a mandatory, 36-hour rest stop, the last checkpoint before teams hit the American summit and cross the border to Alaska. 22 of the 30 teams have now checked in, with Isabelle Travadon being the most recent, checking in at 9:12 PST this morning (Wednesday). 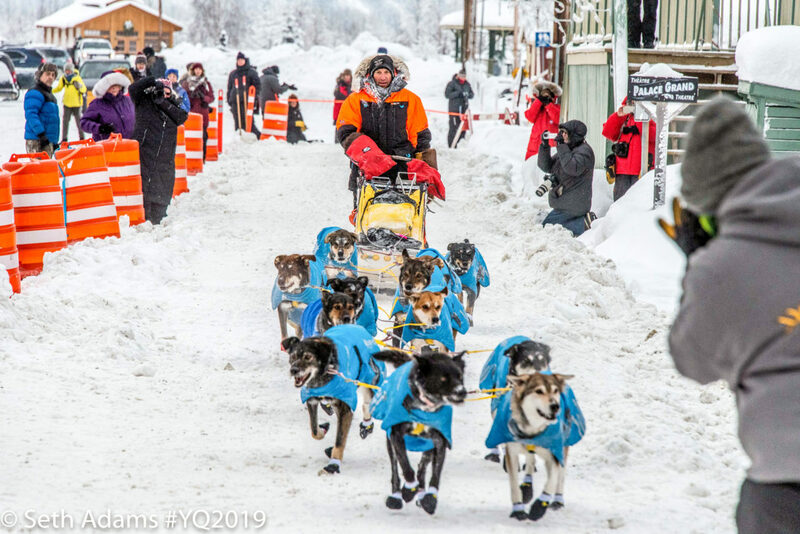 While Harris noted that most mushers are likely resting at the moment, there are plenty of potential challenges in the next leg of the race. From Dawson, it is 150 miles to the next checkpoint at Eagle and then another 160 miles to Circle, much of which is along the river. But for the moment, teams might be able to expect fair conditions. There is light snow in Dawson, and conditions look clear coming into Alaska, with temperatures well above 0° F. That is unusual weather for Harris. The top five positions currently consist of Brent Sass, Michelle Phillips, Hans Gatt, Allen Moore, and Paige Drobny, respectively. Of note was a remarkable gain by Martin Reitan. On Tuesday morning he was in position 18 but checked into Dawson City at 11:37 PST last night (Tuesday), which places him in position 11. KNOM will continue to give you the latest race updates, trail reports, and Quest news at 9am, noon, and 5pm on 780 AM, 96.1 FM. Image at top: Hans Gatt arrives into the Dawson City checkpoint on Tuesday, Feb. 5, 2019. Photo: Seth Adams, Yukon Quest. Used with permission.